I am very grateful to the Admin of ‘Tribute to Sai Baba’ for providing us a beautiful platform where we don’t hesitate to share our daily life experiences with our dear Sai Ram. Considering small experiences made me feel like I should also share mine but this time, I have an experience, which made me feel that baba always help his devotees. I am writing a series of events that happened in my life, which made me to get close to my Sai, my Guru, My master. I remember when I was in 12th Class, I attended Sai Baba Madhyan Aarti. 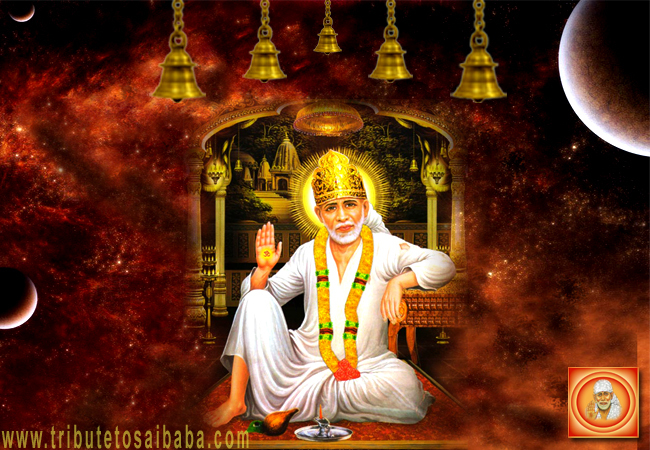 I was not really a follower of Sai baba that time, I used to visit Sai baba temple only to accompany my parents. Just after the Aarti, I saw an old man distributing books. He approached me and gave a book of Sai baba Aarti lyrics. I refused it because I was scared of accepting things from strangers (I think I was rude). Time passed by and I finished my 12th class, and got admission into a prestigious Institute, and finished my bachelor of technology with ~70% marks. I was an average student but I was not sure how I was able to pass every difficult situation in those days (Sai Baba who was with me all time, and I didn’t realize by that time). I went to Shirdi before coming to US for my Masters. See how quickly time ran. I still remember the time when I lost my baggage at the airport, when I first landed in US. I was scared because it was the first time I was away from my parents and home and new things were happening in my life even though I was excited. Just after 4 months from arrival in U.S., I was left with a very little money. I was not quite sure how my expenses will be paid as I didn’t have a job and I didn’t want to bother my daddy for more money. It was my Sai Baba who helped me in the form of compensation paid by the airline company for my lost baggage. I was able to pay my expenses for the next 6 months. Still I was not able to recognize that my dear Baba is helping me. In the second semester I was rejected by Department of Mathematics for the GA (Graduate Assistant) position. I badly needed a job to pay my expenses again. Then miracle happened and I got a call from a professor and she told me that I was hired as a GA for that semester; I was in deep shock because I didn’t ask that professor for GA position, and she didn’t know me either (BTW I was refereed by my DEAN for that position). It was Baba’s wonderful miracle, which I didn’t understand. I am really very thankful that baba has realized that his devotee is in trouble and helped me. Days passed, and I was able to finish my major masters courses and I was looking for a Job to settle down and I applied for various job position but I was receiving rejections one by one. A friend of mine was also helping me to apply for various job positions and everything was getting rejected. That time was not that great, but still having faith in the baba’s divine power, I am totally fine. One fine morning she suggested me to read Sai Satcharitra and do pray for lord Surya, I was not aware of Sai Satcharitra. I moved to another city as things made me to do so and started visiting Sai temple every Thursday. Everything from then on is a Miracle; and I can feel the baba’s presence abound me. Since December 2012, to this Minute of sharing my experience, whatever I have achieve is all because of my Sai. 1. Got a job on December 26th, it was a miracle as the interview went for just 10 minutes and the interviewer who became my team leader later. I was surprised to see that he was also an ardent follower of Sai baba. 2. Another surprise that same day (December 26th) inaugurated Shirdi Sai Temple, where I lived for almost 2 years. 3. My home was just 2 miles away from Shirdi Sai temple in Rockies, all my colleagues and roommates are ardent followers of Baba & we never missed Thursday’s Dhoop Aarti. I am so blessed to be part of Aarti. 4. Visited my Parents with the blessing of Baba, and went to Shirdi in that trip. Another great experience in my life. 6. Had to relocate to a different place on October 15. I was expecting that change and it happened on expected time. 7. Meet with an accident and nothing happened in that incident and baba answered me that things will be ok just keep faith and have patience. 8. May 9th Sai temple opening in the city where I am currently working my new place. My Confidence, Approach in Life, Positive Attitude has grown multiple folds since December 2012. The whole credit goes to my lord Sai. There were numerous Experiences of Baba since last 3 years; Sai Baba took care of me every time in every difficult situation. My day starts and ends with Sai Baba now. 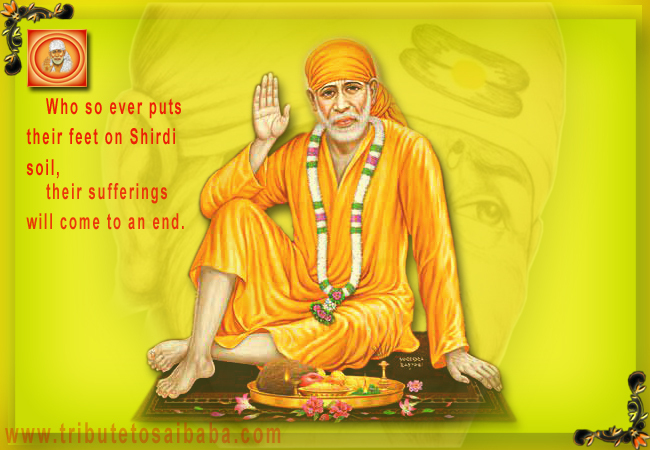 Just have faith in Sai Nath and patience; Baba is always there for us. Jai Sai ram!